Pope doesn't seem to mind the company. This is super cute. Thousands of Catholic families from around the world gathered at the Vatican over the weekend to celebrate the Year of Faith with Pope Francis. On Saturday evening, a small group of children was invited to sit on the pope's platform to listen to speakers from across the world speak about their faith and families. While representatives from more than 80 countries addressed the pope, a little boy walked onto the stage to say hello. 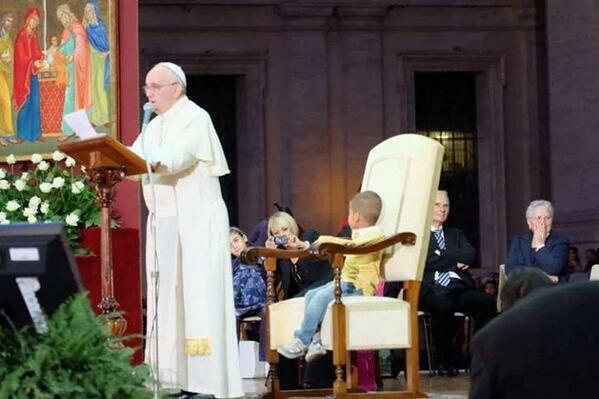 Pope Francis was visibly amused when the child stayed on the stage instead of returning to his seat on the steps. He refused to leave the pope's side, even at the encouragement of several cardinals. When the representatives came forward to greet the pope, the little boy was initially not amused. But then he realized what was going on and decided to help out. When Pope Francis began his speech, an aide attempted once again to make the child return to his seat. The little boy refused, wrapping his arms around the pope in a tight hug. Pope Francis didn't seem to mind. In fact, he seated the boy on his chair before resuming his speech. Love. Kid runs on stage during @Pontifex speech, hugs him, Pope sits him on his chair to continue the speech. Luke 18:16: "Let the children come to me and do not prevent them; for the kingdom of God belongs to such as these."